I recently posted a recipe for Vegan Golden Turmeric White Chocolates, and you all seemed to love them so thank you for all the love! 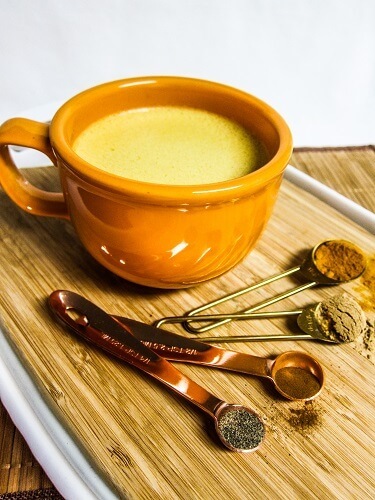 But I also have had many requests for a golden turmeric latte recipe, since I mentioned in the post that I have been loving those and buying and making them in the past few weeks. Well, last weekend I wrote it down, so I could share it with you all! It is pretty simple and straight forward which is always good when it comes to recipes you are making when you just want to sit back and relax. Trust me, this drink is perfect for sitting back and relaxing with! The first golden latte I had a few weeks back at a coffee shop was made with oat milk, but I made mine with almond milk. It was delicious but at home I usually make almond milk. Why don't I just buy it at the store" Well, I find I like my home made stuff the best when it comes to nut milks (no weird additives or too much sugar etc. ), and it is so quick and easy to make anyhow! So I have included my recipe for that as well. But if you prefer to use your own favorite almond milk (or other milk if you are allergic to nuts). I just love the almond milk flavor with the spices! I know I use a lot of coconut milk in everything else, and that is good in this too but I wanted it a little bit less thick.